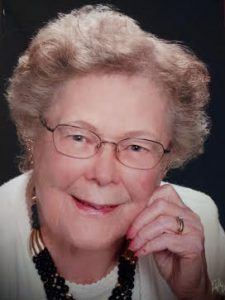 Millicent Rench, fondly known to those who loved her as “Billie,” was a passionate spokesperson for mission in her local church and throughout United Methodism in eastern Michigan, an area known during her life as the Detroit Conference of the United Methodist Church. Rench was also passionate about her church family. Toward the end of her life, she shared her belief that growing up as a single child in a loving family laid the foundation for her fervent love for her church family. Her family as she grew up did not attend church, so she began attending a local church herself as a child, one which her friends attended, a neighborhood United Brethren church. It was that church which helped her obtain a scholarship at Bible College in Naperville, Illinois. She joined the Methodist Church at the time that she married Douglas Rench and moved to Chesaning, Michigan. She would later remark that she merged the United Brethren and Methodist churches in her own faith journey before the denominations themselves merged. She had no hesitation when she described her church family as being present to celebrate the joys of life as well as to cry tears when personal tragedies emerged. As a result of her love for her church family, doubled with an ardent support of missions in the United Methodist Church, she became known throughout the conference for her avid promotion of United Methodism’s involvement in the lives of those in need around the world. Her love of mission entered her life strongly and in surprisingly new ways after the Rench’s family of three sons grew up and moved forward with their adult lives. As chair of mission ministries at First United Methodist Church, her home church in Owosso where the Renches later moved, she attended the conference’s annual Christian School of Mission at Adrian College. Hearing Dr. George Sommers, a presenter there, describe an upcoming seminar in India where he was actively serving in the mission field himself, she was moved to meet him personally following his presentation. Her own church had recently covenanted for salary support of yet another United Methodist mission couple serving in India, and Rench promised to pray that he would find the right 30 people to take part in the seminar which was planned for the following year. “Why don’t you go?” was the response she received when she expressed her pledge to be in prayer for the project. Rench remembered how she put her reservations into words. “I’m not qualified…..I have no talent or skill… I have no money.” The money was a big hurdle, as the Renches had just finished putting their three sons through college, all three at the same time. Rench agreed to pray about the possibility of attending this event herself. She went home with a new fire burning in her heart. After a search of resources in her local church and district, she discovered that there were no scholarships available to support her in this endeavor. About the same time, another member of her local church, Joan Melzow, aware of Rench’s determination to attend the five week long seminar in India, contacted her with some exciting news. Melzow said that while she was attending an executive committee meeting of the United Methodist Women at Owosso First UMC, a decision had been made to direct $500 in their scholarship fund to support Rench’s participation in that seminar, known as “Journey of Understanding”. With the financial support of this scholarship, Rench was able to attend the seminar. During those five weeks in India, Rench learned about the history and culture of India, about its early political structure of kingdoms, its status as a former British colony, its caste system and culture of many faiths, only two percent of the faiths Christian. She also experienced what would prove to be a highlight in her life, spending a day with Mother Teresa. “This opportunity changed me completely,” Rench later observed about her participation in the seminar. She would come back home to serve as secretary for eight years of the Detroit Conference Board of Global Missions, and to become Director of Global Ministries for the United Methodist Church for another eight years. Through this latter role, as her family and church friends would recall, she visited many third world countries in order to observe firsthand the needs around the world and the help being supplied through United Methodist programs. She also communicated directly with many missionaries. Locally, she continued in her home church as chair of Missions, a position she filled for over 30 years. During her last 20 years of active mission work in what was then the Flint District of the Detroit Conference, she organized and chaired the Liberia /Haiti Covenant Committee. She also was instrumental in leading the district to raise over $100,000 for a special year of mission emphasis. The Liberia and Haiti mission outreach will continue in the Michigan area as the Detroit and West Michigan conferences merge, a direction currently underway. She also organized numerous Volunteers in Missions trips. During her lifetime, she visited all 50 states in addition to 50 countries. It was this collection of experiences that fueled her passion and drive as she advocated within her local church and around the Detroit Conference for support of missions in the United Methodist Church. Rench left her passion for mission in the hands of others in her beloved church family in March of 2017 when she was called home to be present with the Lord she served so diligently throughout her life.